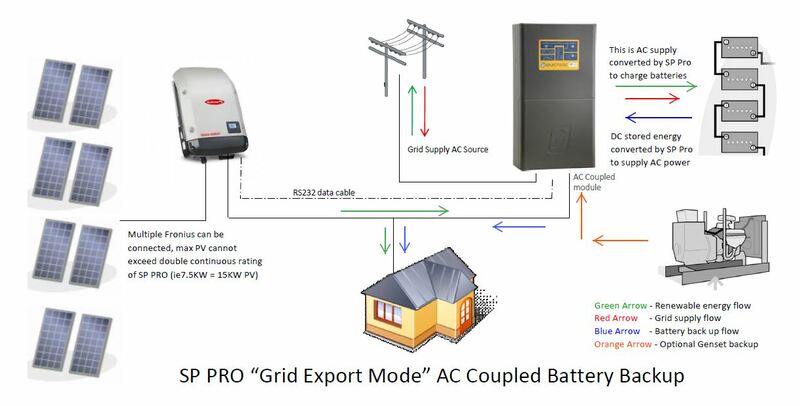 Solar & Battery Systems - using the best of both worlds on the grid ! An emerging trend is for so-called hybrid systems which take a little from battery storage and a little from the grid. Such systems could either be described as an off-grid system which uses the grid as the standby generator or a grid-connected system with some added battery storage. Either way, these systems don’t require expensive diesel generators since the grid provides that service, and the size of the battery arrays can be downgraded as the cost of back-up power using grid electricity is much lower than that provided by diesel generators. With a power system based around the Selectronic SP PRO series of Intelligent Inverters, it is now possible to have complete control over how, if and when you use grid electricity. 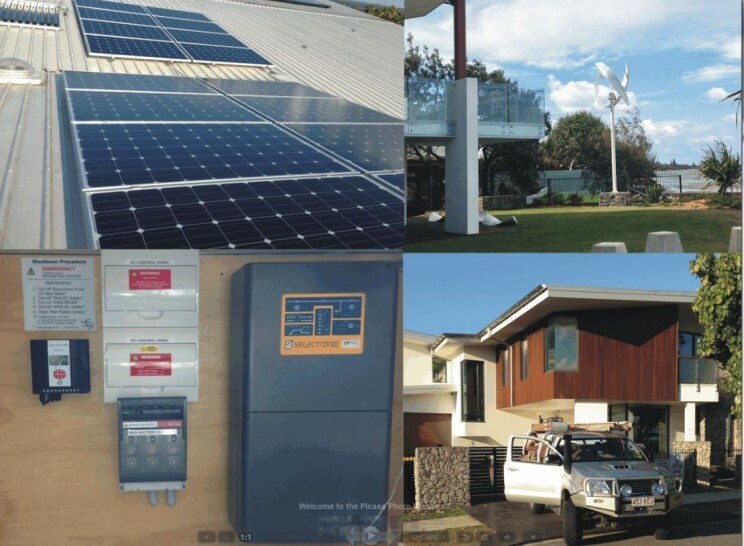 A cost effective solar installation uses a Selectronic Certified Grid Tie inverter to directly supply AC loads and charging batteries, while excess Solar Power is exported to the Grid. Using a Selectronic certified Inverter allows a fully managed battery storage system to be added at a later date giving you access to a new world of features and possibilities. A Selectronic Certified Inverter gives you maximum flexibility for now and the future. With its configurability and free software upgrades, your added battery storage system will look after you well into the future – regardless of changes in electricity supply structures. It is critical that the above features are designed for your hybrid system for your individual needs allowing for future expansion if the case may arise in the future. Ecoast Energy team will design the best system to provide a continuous power 24 hours a day to enjoy all your creature comforts without interrupted supply. Energy source - Wind, sun or water or generation in the case of backup power. Management - Integrated inverter/charger - this device maintains continuous 240Volt supply and required renewable "preferred" power to supply the batteries. Storage - Batteries considered the life support of the energy supplied to the hybrid system. Delivery - Inverter - A vital part in larger systems that are more dependent on AC power supply the inverter is the brains of the energy management process. A grid hybrid system is not limited to one energy source, they can be combined to deliver power. For example using wind a solar power you will have constant sun during the day and wind can deliver power on a 24 hour cycle therefore increasing the benefits of a reliable designed system. Quality products sourced locally and globally for ultimate perfromace, styling and robust Australian conditions. We at ECoast Energy are continually keeping up with all the latest information and regulations so we share our major links with you below. Copyright 2015 ECoast Energy. All rights reserved.